TheWoodHaven2 • View topic - How to make an off the shelf shed last? How to make an off the shelf shed last? 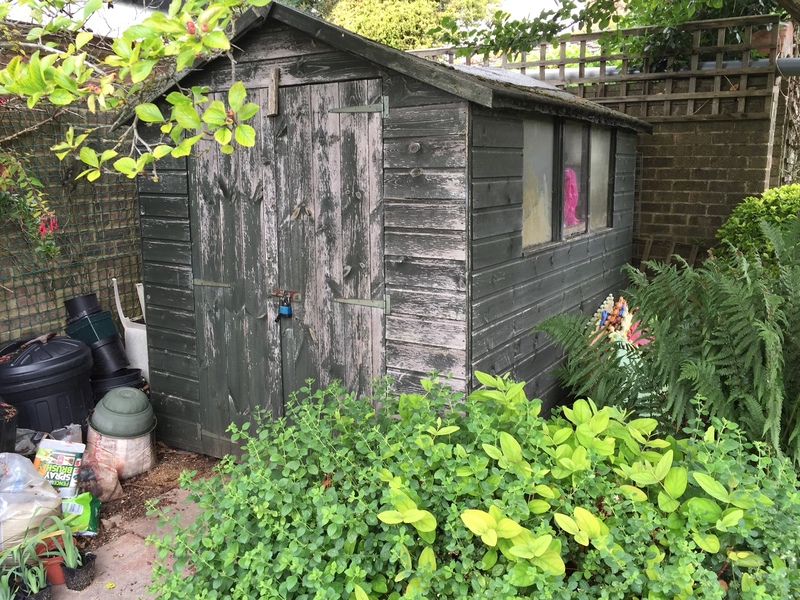 I've been following the threads here for a while with the hope of building my own storage shed but I've run out of time (baby due) and need to get something up quickly to act as a garden store and be a garage overflow. We've had an approximate 8'x6' area laid with paving slabs ready for a 7'x5' shed. I thought I'd seen some notes before about how to beef up the base of a shop bought shed but can't find it now. Any pointers? Should I just be putting some treated timbers down to keep the base of the shed off the slabs? Re: How to make an off the shelf shed last? Anything you can do to get the shed up off the ground will help. There's not much you can do about the walls, but the base, that's a different thing. Treated timber is not the answer. You will cut it, and put holes in it, so the treatment is bypassed. It's obviously a lot better than untreated, but any timber at all sitting on the ground will be subject to rot in the end. Raise the shed on anything you can that is impermeable. A brick (or block) plinth is ideal, but a dry stone wall arrangement of broken paving slabs or a row of car tyres packed with shingle would do fine. Even UV resistant sand backs packed with shingle would do well. Look at the structure of the shed, such as it is. They are almost never braced, and generally end up racking ("parallelagramming") out of shape. A simple diagonal brace across the inside face of the walls would prevent this, but you have to do it when the shed is new. thanks for that. Just to be clear, I have a base of paving slabs that is just above ground level and you're saying I should raise the base further on bricks/blocks? I did keep the bricks that were part of a raised bed that was demolished to make way for the shed. I could clean those up and mortar them in place as a base. I'd suggest all timber at least 150mm above the nearby surface. A couple of courses of bricks. Depending on the design of the shed floor panel, some piers underneath on about a metre grid might be advisable too to reduce bounce. Strips of damproof course on top of all bricks to isolate the timber from the bricks. I used a ready made 8’x6’ shed on a paving slab base for about 20yrs until the roof started to splay. It was raised off the slabs on bricks. I rebuilt it a year or so ago to Mike’s spec. and reused what I could from it, mainly the ship lap cladding. So with a bit of care it should last a long time. I’ve recently beefed up an off the shelf shed, we were given new sheds at my local allotment by the trustees but they were terribly flimsy affairs. As already suggested I placed mine on 4 rows of 6” high concrete blocks laid on their sides. I put an inch of celotex on the floor & covered that with some moisture resistant chipboard flooring gluing the t&g’s. On the internal walls I put a thin layer of insulation inbetween the studs & then overboarded with cover sheets of MFC this had transformed what was a very flimsy structure into a very solid one. Most of the materials were surplus from jobs & the MFC was from my local wood yard who were more than happy to let me have as many sheets as I could use. OK, brilliant, thanks all. I'll see if I have enough bricks lying around. One last question. Where I have to put the shed, the two sides closest the back and side walls are going to be pretty close so I won't be able to treat them once in place. Does that mean I should get a pressure treated shed such that I can just paint it once and be done with it? Or will a standard dipped shed with a coat of whatever preservative that I can put on be good enough? sjalloq wrote: OK, brilliant, thanks all. I'll see if I have enough bricks lying around. If I were doing this I'd be soaking all the wood in "Real Mans Full Lead" creosote and yes you can still buy it. Google for bird brand creosote. Keep applying it until it will take no more but take care not to spill it on the soil as it will kill anything in that too. A quick flow up question on this as I'm doing the brick work this weekend. In Mike's shed builds the sole plate is strapped to the bricks but my shed Congress with just the floor bearers. Do I need to fix that down somehow or does it just sit on top of the dpc? I hope others will correct me if I'm wrong, but a shed is portable, so it's built to be movable. I think treated bearers on top of DPC should be adequate, but ensure there is an airflow under them. e.g. include air bricks opposite eachother. We'll, I managed to get some sort of base down this weekend. First time bricklaying but it was fun. My first mix was a bit too dry and two sides have an extra half brick as my spacing went a bit wrong. But overall, I'm fairly happy. Just need to bed in the rest of the DPC at some point. Looks alright. Did you mix mortar by hand or hire a cement mixer? Coolhands wrote: Looks alright. Did you mix mortar by hand or hire a cement mixer? I'd have thought that for that small quantity, a cement mixer was a bit OTT ! By hand in that yellow bucket. Wasn't too bad as I just did small batches. I use a piece of board, make the mix into a hollow volcano, add water then shovel gently into it. Add more water carefully and mix with shovel. So I finished up the shed this last weekend after putting on something like three or four coats of creosote and waiting for it to soak in as much as it would. Seems to be repelling water pretty well! The shed is from Tiger Sheds and was that horrid orange colour so I'm very happy with the black. It's gone together pretty square but I'm going to fit some ply/OSB this weekend not only for strength but to provide anchor points for shelves etc. Looks perfect. Hard to see how that won’t last 20 years. Well that's got a much better chance. Well done. Did you brace it internally? Should last well with all that creosote. Still don't think you can beat creosote ! I can smell it from here! I really must get some. Andyp wrote: I can smell it from here! I really must get some. I am aware of the bird bird brand stuff. I have never seen anything like it here only the subsitutes.